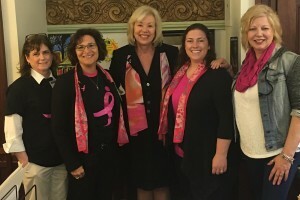 In the spring Komen Chicago teams up with the American Cancer Society, and the Metropolitan Chicago Breast Cancer Task Force and travel to Springfield for the Annual Advocacy Day. Advocates meet with elected officials to educate them on the importance of IBCCP to their communities. The trip is open to anyone who is passionate about health equity and reducing the disparity in breast cancer mortality for women of color. Adequate funding for the Illinois Breast and Cervical Cancer Program (IBCCP), which funds free mammograms and Pap tests for uninsured women – we ask our legislators to reject the Governor’s proposed budget cuts to IBCCP and maintain funding for IBCCP at $11 million. Since 1995, the Illinois Breast and Cervical Cancer Program (IBCCP) has offered free mammograms, breast exams, pelvic exams and Pap tests to eligible women and allows eligible women diagnosed with breast or cervical cancer to receive treatment through Medicaid. Call on the Illinois Department of Healthcare and Family Services to implement the Breast Cancer Excellence in Survival and Treatment (BEST) Act, Public Law: 99-433 immediately. Vote YES to increase the minimum buying age for tobacco products in Illinois to 21 years. On May 12, 2016 Komen Chicago staff and board member traveled to Springfield and met with State Senator Julie Morrison.